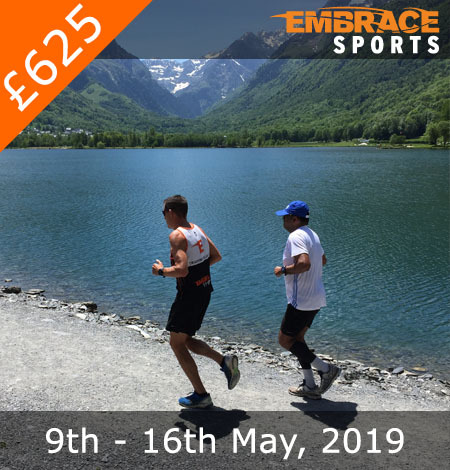 Reserve your place on the May Pyrenees Running Holiday. The Pyrenees is one of the most amazing locations that a runner can experience. Well known worldwide for the famous Tour de France cycling Col’s, the Pyrenees hosts magical trail, valley, woodland and lake runs that complement the purity the sport. Our week will showcase not only the nature of these beautiful runs but will allow runners to visit historic towns as well as try their hand at cycling as an optional activity during the week. I had an amazing week with embrace! The surroundings where great for running, hills, flat. Great nature. The homemade food by the coaches was also great. I loved all the trainings, the hills are hard but make you an stronger runner. Also the stretch sessions where awesome. Ii only have good things to say about the holiday. The coaches are great, very approachable. I had a fantastic holiday in the Pyrenees. The sun shone all week long and the views from the rustic farmhouse were stunning! 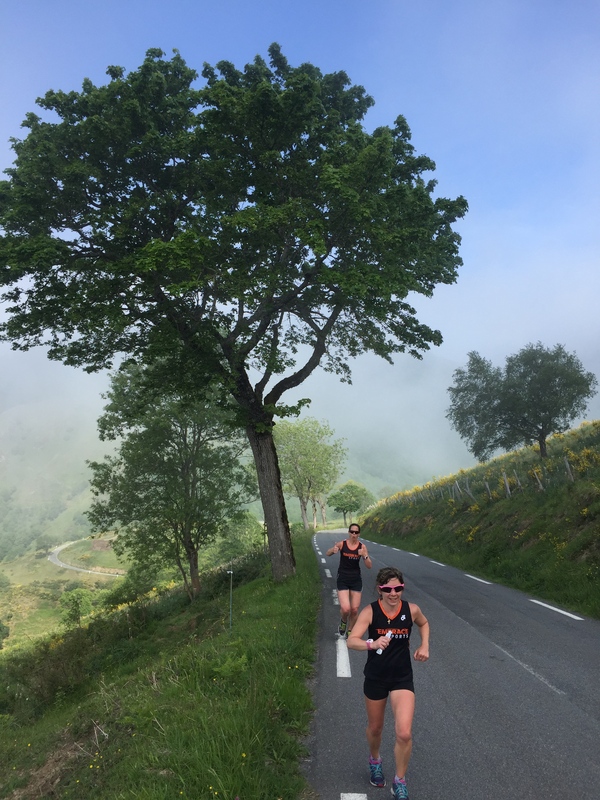 We ran in a variety of beautiful locations, including a long run on a woodland trail, 1k reps in a park, a steady 10k lake run surrounded by snow-capped mountains, finishing with the 12k Col D’Aspin uphill road run. There was a complete mix of abilities and experience, but the coaches tailored each run to suit everyone and there was great camaraderie within the group. The running holiday in The Pyrenees is a must! I can’t recommend it highly enough. The training is hard, but fun, the coaches are knowledgable but very friendly and the food is fabulous! 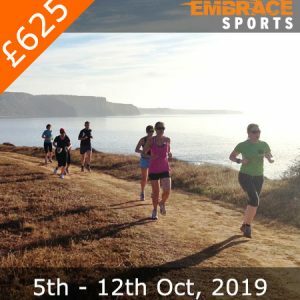 My first running camp/holiday, wasn’t quite sure what to expect but this was superb – lots of varied runs in stunning locations, great food, plenty of booze, great company…just need to practice the darts! Loved it so much last year, back for the second year running. Once again a fantastic trip with excellent Coaches and like minded runners making for more great memories. Can’t recommend Embrace Sports highly enough, never disappointed. Looking forward to the next trip. This was my 9th camp! My first camp was February 2011 in Portugal and that’s where I’ve been going ever since. This year I finally decided to try another location – the Pyrenees. I had no idea what to expect, other than a lot of hills and I don’t like hills (as a rule)! All the usual praise applies – the hospitality, run routes, food and accommodation were spot on. The location was so peaceful and utterly stunning, despite the rain! The highlight was, of course, running up Col d’Aspin on the last day. It was a daunting prospect but my goodness what a game changer that run was. The second half pushes you to your edge, but with an epic team spread along the 12km climb cheering you on (literally and in spirit) running this col was an experience everyone should have. Not only is it stunning, tough and emotional, it’s levelling, time to get perspective realise that our bodies are capable of the most amazing things and we need to be proud and thankful everyday that we have the opportunity and ability to do this stuff. I can’t thank the Embrace team enough for this experience. I can’t wait to do it again!! This was my second Embrace Sports holiday in eight months. This picturesque farmhouse located in the French Pyrenees is a fantastic location and setting to train. I really enjoyed running in the scenic countryside, trails and a lake! The Col d’ Aspin challenge on the final day of training was incredibly rewarding. I felt really good completing the challenge with the training schedule priming you for the challenge. It was fantastic running with good people, knowledgeable coaches who are also excellent cooks. The meals are simply awesome. I plan to go for my third Embrace holiday soon. This was my 3rd Embrace holiday & yet again really enjoyed it with a great group of fellow runners. We ran in different locations with amazing views with the highlight running up Col D’Aspin. The coaches are friendly, supportive to everyone of all abilities & also serve up delicious food. Already booked my next trip with Embrace. Second time in the Pyrenees – and it was a great trip with lovely people. Brilliant mix of training sessions in a series of beautiful locations – even on a week like this when the Pyrenees weather was doing it’s 3 seasons in one day thing. Love the farmhouse and the views! And absolutely loved the final challenge of the week – running up Col D’Aspin. 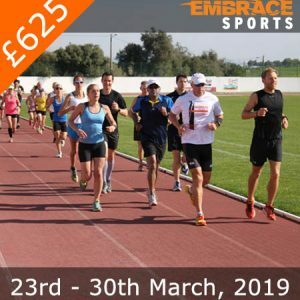 It’s great to do something out of the usual – and the Embrace crew really know how to put together a week’s training – and great food – that gets you to your goal. Will be back I know! My first run camp which met all my expectations and more. A great training week in some beautiful settings with friendly and knowledgeable Coaches. Great food, great accommodation, great people, great weather and beer and wine on tap makes a happy customer. And the Col D’Aspin run challenge rounded off the week perfectly. Looking forward to my next Embrace trip already. Thank you for the memories. Had such a fantastic holiday!!! Never thought I could conquer a col but with great, enthusiastic coaches and running team mates everyone powered up the col d’Aspin in style. This was a super way to finish a fantastic week of running which also included time in the hot tub, some epic battles on the table tennis table and lots of glorious food!! This was my first embrace holiday but it definitely won’t be my last! My 5th week on an Embrace camp and, first time outside Portugal, and probably the best week yet. As usual, great training, great food, great company and the occasional beer! Run up Col d’Aspin probably straight to the top of my list of favourite runs. Looking forward to conquering more Cols in The Pyrenees or The Alps next year! This was my first trip with Embrace and it certainly delivered. Even as an experienced runner I gained a great deal from the new terrain, helpful training advice and good company. The week consisted of a successful balance of challenging running with time to rest, relax and refuel on delicious food. Not only did I meet some fabulous new friends, but I learnt a great deal about my own capabilities, especially when conquering Col d’Aspin at the end of the trip! Well done Embrace team! I really hope to be back for another trip soon. 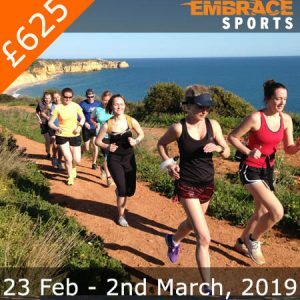 After several trips to the Algarve running camps, it was time to try something new in a new location. Tucked away surrounded by fields, it is a rustic contrast to previous camps, and most enjoyable. The best part for me was the lakeside running, stunning views of the mountains, then the epic climb of Col D’Aspin! Straight into my top 5 best ever runs, the scenery was stunning, changing on every turn, and the reward of reaching the top being greeted by a family of mountain goats was just epic! Recovering in the hot tub with a beer and making great new friends was awesome! It was my first holiday with Embrace and I just enjoyed every minute. The place was so beautyful. The thre coaches was amazing and learned me so much, and I am now able to ran at least 15K without stopping, I hav never dreamt of being able to do this, and after only 7 days. I hope to return som e day. I’ve enjoyed all my Embrace running holidays. Was definitely up for a new challenge. Loved the mix of training sessions in the spectacular setting of the pyrenees . And I really can say that I ran all the way up Col d’Aspin. All 12k of climb. And met a crowd of lovely runners, with a wide range of abilities and experience, who got to the top with me. That’s the power of the skilful mix of training you get on these holidays. My sixth Embrace Camp but my first outside Portugal…..and it won’t be my last! The varied training runs (including two Cols!!! ), outstanding food and great company in the stunning setting of the Pyrenees was a winning combination. There was also plenty of chill out time in the hot tub in the afternoons, lots of games of bananagrams and despite a few rain showers we were able to sit outside our beautiful farmhouse for dinner every night! Thanks again Eric, Neil and Rach. Looking forward to the Alps next year. Yet again, Embrace have delivered. A fantastic week of running in some beautiful surroundings. The setting, food, coaching and fellow runners made for a very enjoyable week. A perfect mix of running, relaxing and socialising with fun folk. Having been on 10 camps in the algarve this was my first trip to the Pyrenees. It was a totally new running challenge not about speed or distance but strength and endurance to conquer the infamous cols. The group size being smaller made for great team spirit and camaraderie. And all in the most stunningly beautiful location. Amazing.